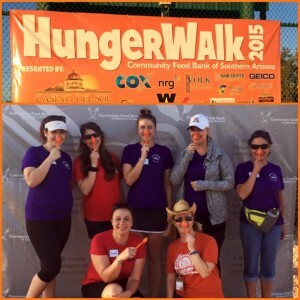 DIAD: Hunger Walk 2015 | Junior League of Tucson, Inc. In Arizona, 1 in 5 adults and 1 in 4 children is at risk for hunger. The Community Food Bank of Southern Arizona serves people in five counties of Southern Arizona, with its main office and distribution center in Tucson. Clients come from all walks of life to find emergency food and resources. Twenty percent of the clients served are senior citizens . Our Community Food Bank provides emergency food and is also on the forefront of a movement working to eliminate the root causes of hunger through education and opportunity. Community partners like Junior League of Tucson help make serving our neighbors in need, possible. In recent years, volunteers have worked so many hours, it’s like having an additional 95+ people on staff. The women of the Junior League of Tucson have contributed time, talent and treasure to help the Food Bank serve more of our neighbors in need, and bring hope to those who are struggling. During Hunger Action Month, September 2015, JLT volunteers helped with early morning registration for the Food Bank’s largest annual awareness event and fundraiser. The event raised over $115,000 for support of vital programs. These funds support things you might not expect from a traditional food bank – like sustainable agriculture education and entrepreneurship for small, local farmers – so they can feed their families and earn income by selling fresh produce. These funds also make possible the Food Bank’s work to supply nutritious food to school pantries and to provide backpacks of food so school children who would otherwise go home to an empty cupboard, can be nourished and have energy to learn and thrive. From packing emergency food boxes to working special events, Junior League of Tucson volunteers have become incredibly helpful partners in alleviating hunger and building awareness of the issues we face in our Southern Arizona community.